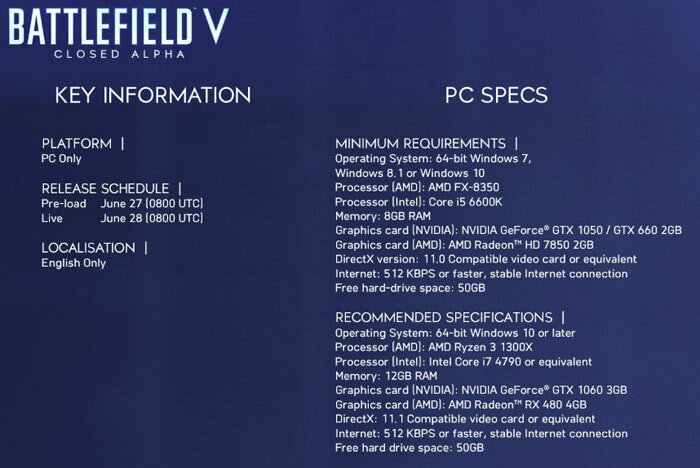 EA/DICE has shared the minimum and recommended PC specs for the closed alpha of Battlefield V. Battlefield V was shown off by EA at the recent E3 show and it will be released worldwide on 19th October (or a little earlier if you pre-order or are a subscriber). Ahead of that time the game, set in WWII and said to include a 'battle royale' mode, will be available as an alpha test version to select invited Battlefield players who will get invites to redeem via the Origin client. Residents of many world regions qualify for the closed alpha but the PC only test release will only be in English for now. The closed alpha has already started, at 9am this morning UK time, so if you have an invite you can load it and start playing. Lucky invitees get to play the Grand Operation Fall of Norway. On the Arctic Fjord map you will experience two 'days' with two modes. As part of the 'Airbourne' mode you will either parachute onto the frozen battlefield to take out artillery, or defend - depending upon which side you are on. Secondly you will participate in 'Breakthrough' capturing map sectors as an attacker or keeping the opposition at bay through on-the-fly planning. 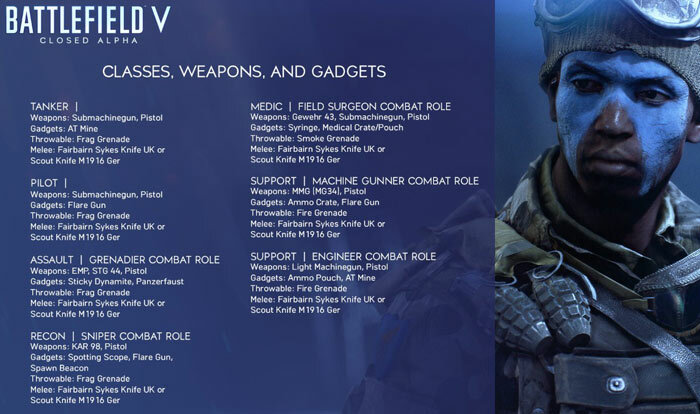 Alternatively there is the Conquest mode to enjoy and this is "this is the timeless Battlefield classic where two teams use infantry and vehicular combat to seize a majority control of key control points," says EA in its blog post. To enjoy the closed alpha on your PC it might be useful to know the minimum and recommended specs, which you can see tabulated below. Remember that the minimum and recommended specifications for the closed alpha may not directly align to those for the final game. It being EA puts me off too. I love how they made a mode which games like UT99 had a whole genre. What next,a genre called flag wars?? Not that i'd touch an EA game nowadays but how is minimum spec i5-6600K yet minimum i7-4790? Is a two generation older i7 that much faster than an i5? Bet my OC'd 3570k would run it fine anyway… It seems they just pluck these CPU specs out the air. Wasn't this one supposed to be in space… or was that just an April 1st joke? It seems they just pluck these CPU specs out the air. When an i5 6600k is a minimum requirement but a Ryzen 3 1300x is recommended, you know something is wrong, could just be and probably is unfinished optimisation, but even if so they better fix that quick.